Let’s examine the evidence again. Starting in 1916, Sanger’s clinics at first were aimed mainly at poor immigrant women. The first clinic was in a neighborhood “populated largely by Italians and Eastern European Jews,” according to the 2010 book “Birth Control on Main Street,” by Cathy Moran Hajo. Sanger did not open a Harlem clinic until the 1930s, even though infant mortality rates there were similar. Hajo found that in the 1916-1939 period, white activists were more likely to exclude African Americans from clinics, rather than include them. There were some half-hearted efforts to create African American clinics, but white activists actually gave little or no assistance. “Whatever the activists’ personal beliefs about race may have been, there was no grand program to exterminate nonwhites or the poor,” Hajo concluded. Sanger recruited black leaders to support the effort and, in letters to the project’s director, urged that white men who were outsiders should not run the clinics. She said the effort would gain more credibility with greater community involvement, given natural suspicions. Sanger was a supporter of now-discredited eugenics movement, which aimed to improve humans by either encouraging or discouraging reproduction based on genetic traits. At one point, in 1934, she even crafted a proposed law that included this provision: “Feeble-minded persons, habitual congenital criminals, those afflicted with inheritable disease, and others found biologically unfit by authorities qualified judge should be sterilized or, in cases of doubt, should be so isolated as to prevent the perpetuation of their afflictions by breeding.” Sanger said she wanted “to give certain dysgenic groups in our population their choice of segregation or sterilization,” which some have interpreted as a reference to concentration camps. Adolf Hitler and Nazi Germany also embraced the principles of eugenics—and put them to genocidal use. But any real link between Sanger and the Nazis, let alone praise of the Nazis for Sanger, is rather tenuous. Carson’s campaign pointed to an alleged connection between Sanger and Ernest Rudin, a German eugenicist who oversaw the mass sterilization policies of Nazi Germany. Carson’s campaign said she published an article by Rudin in the magazine Birth Control Review in 1932, but she had resigned as editor several years before that particular issue was published. The campaign also noted that she appointed to the board of the Birth Control League Lathrop Stoddard, a eugenicist who had close ties to the Nazis and even met with Hitler. Yet one of the most thorough looks at the connection between American eugenicists and Germany Nazis, “The Nazi Connection,” by German professor Stefan Kuehl, makes no mention of Sanger (though Stoddard is featured). 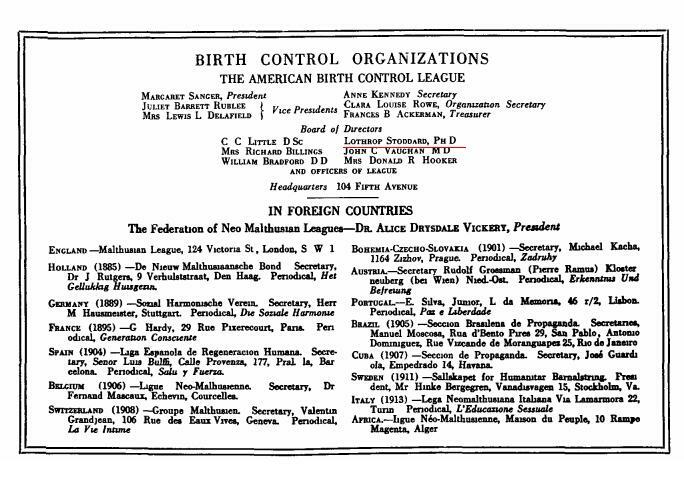 Sanger is briefly mentioned in another of one of Kuehl’s books, “For the Betterment of the Race,” mostly in connection with her efforts to assemble an international conference of birth control specialists to combat overpopulation. While the two previous issues relate to interpretation of history—about which people can disagree—at least here we can deal with hard facts. Are “most” of Planned Parenthood’s clinics in black neighborhoods? The available data, from both sources that oppose and favor abortion rights, says this is false. A 2011 report by Life Dynamics, which opposes abortion, used Census data to determine the African-American and Hispanic population of each zipcode where Planned Parenthood has an office. The report was intended to show that the abortion clinics are placed mostly in areas where black residents exceed the average black population of the state. Separately, in 2011, the Guttmacher Institute surveyed all abortion providers (about 1,700), including Planned Parenthood, and found that 60 percent are in majority-white neighborhoods — and that fewer than one in ten abortion providers are located in neighborhoods where more than half of the residents are black. The statistics did not change when the numbers were adjusted for nearly 600 providers that conduct more than 400 abortions a year. Still, there is clear evidence that blacks are more likely to get an abortion than whites. The Centers for Disease Control and Prevention says that the abortion rate for black women is almost four times higher than for white. The reasons for this disparity are not well understood, though some researchers cite economic issues; the location of abortion clinics does not appear to be a factor. Taken together, Carson’s remarks suggest that Planned Parenthood, as a result of deliberate policies set in place by its founder, targets blacks for abortions. But the evidence shows that a relatively small percentage of clinics are in black-majority neighborhoods — or even in neighborhoods where blacks are more than one-quarter of the population. Sanger’s embrace of eugenics — and her statements in support of sterilization — may be abhorrent today. Her attitudes on race may appear antiquated. But there is little evidence that she targeted blacks for “elimination” or embraced the Nazis, who took eugenics to a horrific extreme. Some readers may believe the historical record is even more damning for Sanger. But the data on where clinics are located is pretty clear. Mixing all of these elements together, with little basis in fact, earns Carson Four Pinocchios.